A historical building known as the Edifice Lucien-Saulnier in Old Montreal, Quebec was once home to the Old Courthouse. 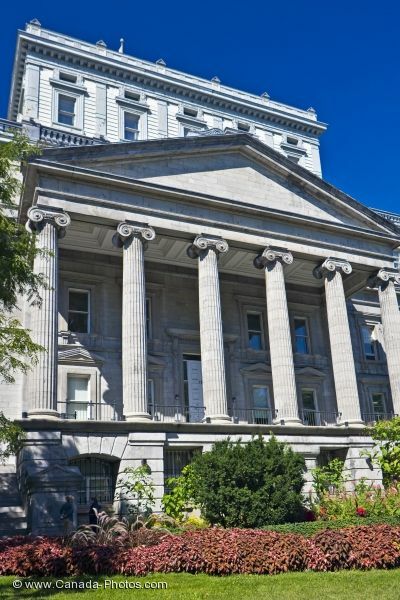 Built in 1856, this historical building was once the courthouse for the city but it now is home to the City of Montreal municipal offices. While visiting Old Montreal in Quebec, Canada, you will find this building along the Rue Notre-Dame at the North end of Place Jacque-Cartier. Edifice Lucien-Saulnier, Old Courthouse, Rue Notre-Dame, Old Montreal, Montreal city, Quebec, Canada. Picture of the historical building, the Edifice Lucien Saulnier in Old Montreal, Quebec.